The Internal Medicine Interest Group at University of Chicago is traditionally run by 4th year medical students who are applying into internal medicine with participation on the board open to all four classes. The goal of the group is to spark an interest in internal medicine in 1st and 2nd year medical students while showing them the career options, to prepare 3rd year students for their medicine clerkships and introduce them to various medicine resources, and to prepare 4th year students going into medicine for the residency application process and for their intern year. One of our biggest events of the year is the IMIG Clinical Case Competition. We collaborate with our group's faculty advisor who also runs a course titled "Turning your Clinical Cases into Scholarly Work" which prepared fourth year students to present in the competition. 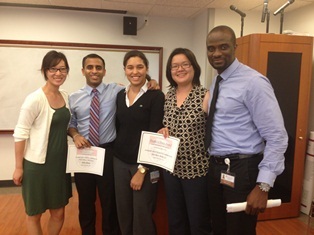 Fourth year medical students and internal medicine residents were invited to compete in a oral case competition. Each competitor was given five minutes to present an interesting case to a room of University of Chicago internal medicine residents, students, and faculty while a panel of internal medicine attendings judged the oral presentations. Presentations were judged for things such as clarity, innovation, originality, and educational value. The competition closely mirrored the format of the ACP clinical vignette competition. The event further encouraged participation in the Northern Illinois ACP Associates Day as the medical student and the resident winner were selected to represent the University of Chicago at the with an oral presentation, while the other participants submitted posters. Crowd participation was encouraged both by questions after the presentations and voting on a "People's Choice" award in each category. After the event IMIG hosted social rounds that Friday evening where internal medicine faculty and chief residents were invited to relax with students over drinks and food. We used the social rounds and case competition to run an ACP membership drive where membership forms were handed out and enrolling in ACP was encouraged and the school's ACP enrollment was increased to 21%. The interest group also works to engage first and second year students through events such as Mock Morning Report where a case is presented with teaching points appropriate for a preclinical student. The students are introduced to learning through case presentations and the socratic style of morning report while being given a chance to interact with chief residents and IM attendings. Our most recent morning report reviewed a case of syncope where preclinical students went over how to form a differential diagnosis and how to read an EKG ultimately "diagnosing a patient" with 3rd degree heart block. The interest group holds a variety of other events throughout the year including EKG and chest X-ray review sessions for 1st and 2nd years, an advice panel with medicine interns for 4th years, a medicine clerkship information session for 3rd years, social events with internal medicine attendings, and ACP recruitment sessions, as well as encouraging students to participate in regional and national meetings.